Block copolymer nano-micelles are especially important in cancer treatment because of their fine dimensions. 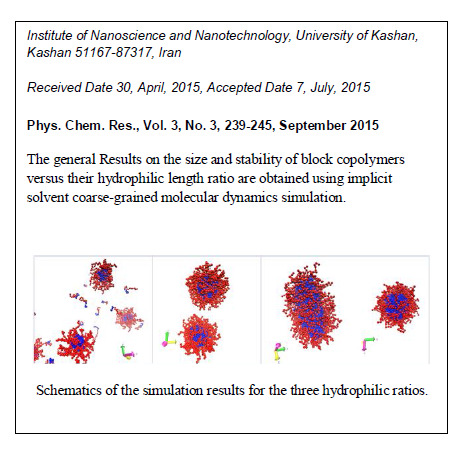 In this article, three systems of amphiphilic copolymers with similar lengths and different ratios of the hydrophobic and hydrophilic chains are studied using implicit-solvent coarse-grained molecular dynamics simulations. The factor fphil is defined as the ratio of the number of hydrophilic monomers to the total number of monomers. 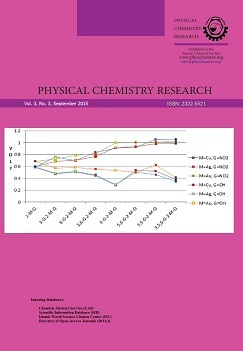 Three different values are examined fphil = 0.65, fphil = 0.55 and fphil = 0.40. The time evolution and the final shape of the assembled nano-structures are investigated. The shapes of the nano-micelles are symmetric in the two larger hydrophilic ratios. However, the nano-micelle becomes asymmetric in the one smaller hydrophilic ratio. The average diameters of the whole nano-micelle and its hydrophobic core are calculated. These diameters are obtained by direct calculation from the particles coordinates and by using the radial distribution functions. The sizes of the nano-micelles and their stabilities increase considerably with decreasing the length of the hydrophilic chain. Correspondence of the results on the geometry, size and stability of the nano-micelles with the experimental findings is discussed.